People need a better way to find the movies, TV shows, or books that they would most enjoy. The enjoyment depends on the psychological elements in the story, such as themes, types of content, character identification, or relationships between characters. For example, one person may want to find movies that include a lot of dramatic behavior and love affair between a beautiful woman and a jealous man. Another person may want to find movies that have heroism and a particular political viewpoint. A new, patented, software invention will allow users to search for movies, TV shows, or books based on the psychological elements in the works. The user begins by browsing predefined psychological elements that may be organized hierarchically. The user selects several elements of most interest and indicates the importance of each selected element relative to the other selected elements. The software application searches a database and returns a ranked list of the works that the user will enjoy. The new search technology can be strongly monetized in ways that depend on the company that buys and implements the technology. Today consumers are increasingly finding and receiving movies and books online, while certain companies are pushing to integrate television and internet. The new search technology presents a timely and exciting opportunity. 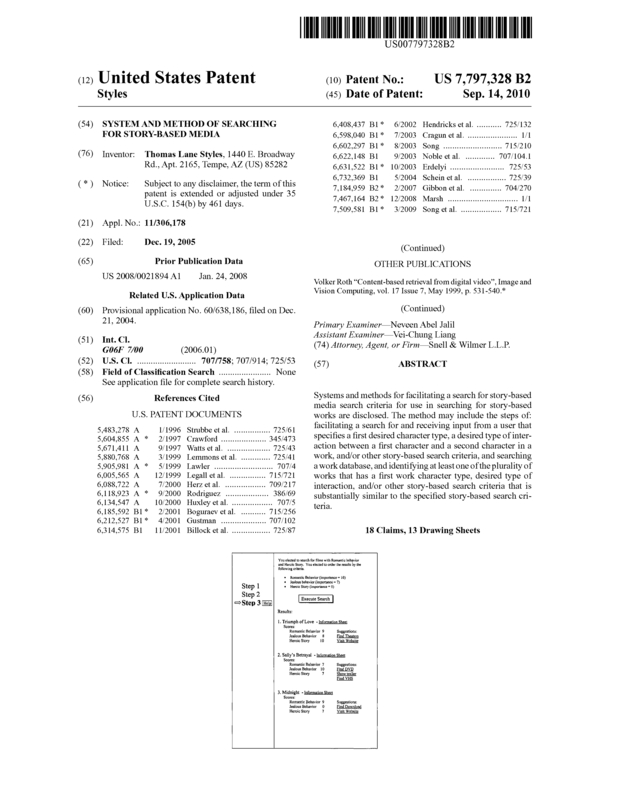 Page created at 2019-04-24 18:25:44, Patent Auction Time.